Tja, wat valt er te zeggen. De kiezer heeft gesproken en heeft duidelijk andere taal gesproken dan ik had voorspeld .. Voorspellen is moeilijk, vooral als het de toekomst betreft ;-). Een korte analyse. Kijkend naar mijn eigen model dan kwam ik op 30 VVD, 30 PVDA, D66 18, CDA 15, en SP 11 (PVV kwam in de telling op 28 zetels). Vooral bij PVDA (veel te hoog) en SP en D66 (veel te laag) zitten we er ver naast. Zelfs de volgorde van de partijen komt niet in de buurt. Kijkend naar de uitslagen (we moeten dan kijken naar het landelijk gewogen percentage want CDA heeft nog steeds het grootste aantal raadsleden omdat op het platteland veel minder stemmen nodig zijn voor een raadszetel) in percentages zou beter zijn. Helaas zijn die niet zo direct beschikbaar. De conclusie kunnen we in ieder geval trekken dat aantallen berichten op sociale media geen goede indicator zijn voor de uitslag gemeenteraadsverkiezingen. Met de Europese verkiezingen hebben we weer een nieuwe kans omdat dan vooral het nationale beeld telt! Sometimes you find something that leaves you breathless. The look and sound of this video really makes me speechless. Lykke Li – Tonight from Lykke Li on Vimeo. Some time ago I wrote about the dangers of developments like child dossiers used by governments. One of the major risks is that people that will use this information use it without knowledge of the context when the information was stored. Information without context is hard to interpret leaves a lot of room for personal biases. The Rathenau project I am doing deals with how the information anyone can find on the Internet will more and more become the context from which much of the official information in databases like Electronic Patient Files, Child Dossier, Civil Administration and others will be interpreted. This I showed also in the case on the social services. And many will recognize how they are using information found on the Internet as the context of the CV of a job applicant. In relation to the social services we can debate whether this is a bad thing. After all the government also used special “kliklijnen” where people can complain anonymous about the black market activities of their neighbour on welfare. Not to say I approve of this method but it is legal. An example someone from CBP gave made me think. Say a woman just found out she is pregnant and has discussed morning sickness on a forum on the Internet. A week later she has a job interview where the HR manager has found this information. Even though as a society we have accepted that a potential pregnancy should not be discussed in job interviews we can not prevent people from using this information when they accidentally find it. And due to all kinds of mechanism I will discuss soon it is getting harder to stay anonymous on the Internet. We can and should not control the information that is on the Internet. But on the one hand we will have to develop laws that govern what institutions are allowed to use and on the other hand we ourselves will have to deal with the fact that much personal information can be found. View more presentations from Martijn Kriens. 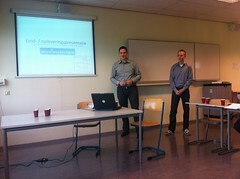 Yesterday I gave a presentation for the Services Innovation unit at SenterNovem and the Economic Affairs department. Focus was on how SaaS is one of the important enabling foundations of service innovations. Service innovation is possible through advancements in ICT but ICT is not a transparent factor that makes everything possible. Some functionalities are easy to achieve whereas some are hard or impossible due to the quirky nature of technology. However, often to little attention is given to the relation between business goals and ICT possibilities. Our statement is that both need explicit attention. View more presentations from mkriens. The presentation is ended with a call to start working on a national testbed infrastructure for the development of SaaS services. Espcially a country like the Netherlands can be strong in delivering services by “mashing up” all kinds of basic services due to our strengths in trade. In the development of the inrastructure needed to create an agile business community capable of creating and delivering services worldwide there certainly is a role for the government. Yesterday I heard an interesting item on the television. In Weesp there had been some threats made towards schools over the phone. In the end it turned out to be little children that made them. Interesting part is how the police found out who they were. The boys made the call to the schools on a public payphone, thinking the y would not be traceable that way. Of course the police could easily find out which payphone was used but by the time they were there the boys were long gone. However, the police was able to acquire several images of video camera’s close by that had the boys on tape while they were making their calls. By showing these video images on national television the parents recognised them and immediately took them to the police station (brave action!). This case does show, even though the outcome is rather positive in this case, that it is more and more possible to follow people and in the end, invade privacy of civilians. Technology allows us to follow anyone we want in many places. Remember, you are being watched! Google is very much working on ways to stimulate conservation of energy. One of the issues they mention on their blog is that by giving feedback to people it is possible to save lots of energy in homes and offices. Some time ago I was involved in a research study where we looked at research worldwide on this subject. One of the most remarkable ones was a study done in Stavanger, Norway. There it turned out that just by changing the period after which people settle their energy bill (you get a bill every month normally but only once a year the energy company checks if the bill is the same as the real (average) use during the year). They changed the period from one year to two months (meaning the amount used was checked bi-monthly and the bill adapted accordingly). The energy use of households after this went down 8%. Because of the bi-monthly check people where immediately reminded that energy costs a lot during winter. With some extra data the savings grew to 12 to 16%. This feedback on use can be more fine-grained. At home I am using a plug from plugwise that measures the use of energy of that energy outlet and allows me to test how much I would save by using the built in “stand-by killer” during the night (it is amazing how much energy some appliances use while on standby, my printer uses a whopping 40 watts on standby, 24 hours a day, 7 days a week). An interesting example how ICT can help to lower our energy footprint. Some time ago I also made a blog on a presentation I gave last year. In Amsterdam we are setting up a project with more than 700 homes where we will be testing what kind of feedback works best (Amsterdam Smart City). Another project I am starting with is the Connected Urban Development where we make it possible to take a look on the energy use in the city and be able to zoom into certain areas, maybe even to an individual level. The document with the research (like the Stavanger case) you can find here. It’s the kind of projects that give me a lot of energy! One of the interesting features of technologies is how it can bring people close together, in real life as well as in perception. Google has an interesting new feature called Google Latitude. Through this service you can show your location to your friends and of course see the location that your friends are sharing with you. Interesting feature is that the application has a fine grained way of setting your privacy in relation to the various friends that you have. This I think is a general direction you see in web 2.0 that more and more people are becoming concerned about privacy and about who really are your friends you are willing to share all. In the past I used an application called IYOUIT that was also capable of showing this like this. To me it was surprising how much feeling is involved in knowing precisely where your friends are. One of the most interesting developments I see at the moment is the move to ubiquitous ICT. ICT in the form of small unobtrusive sensors, smart ICT that takes the context of the user into account (based on all those sensors) and feedback mechanisms to users that do not use explicit displays do this much more on an “experience” level, e.g. by changing the colour of light. I recently read a book called Everyware (as in Hardware and Software) that says some interesting things on this. Sort of like using computers without really using a computer…. A very nice example of this is the “unpronounceable rabbit“. It connects to the Internet, is able to sniff RFID tags and communicate by talking, changing colours, communicates with his ears and all kinds of other things. And the rabbits can talk to eachother so you can send messages to a friend by just twisting his ears.